Were you inspired by our Learning to Read Weekly Kids’ Co-op features last week? I spotted quite a few awesome learning to read posts in the link up for the week that has been too. There are so many awesome blogs out there. I love it! Thank you to the lovely (new and old) readers who dropped a quick note and said ‘Hi’. I was very chuffed when Pete from Say Noodle introduced himself last week because through that friendly “Hi,” I was comforted by the fact that someone was reading my stuff (ha!) and I discovered his totally awesome blog. With a tagline of “making stuff with cardboard and make-do. fast!” how can one resist a quick peep? I ended up browsing for awhile. Totally fun. Totally gorgeous to look at. But then again.. what else would you expect from an art director / designer / creative type? ‘Nuff said. Go! Have fun and explore Say Noodle and let me know what you think, am I right? Isn’t it brilliant? Fresh from Valentines Day, (completely filled with sugary treats and love), this week we’re featuring fabulous math games for kids from the Weekly Kids’ Co-Op. A self-confessed mathematically challenged person, I completely understand and value the importance of a strong mathematical foundation. It’s ironic isn’t it; I’ve taken an extra super keen interest in Math, a subject that’s not my strength. Thankfully there are wonderful and brilliant math teachers who have spent much time and energy thinking through what it is exactly and how best to teach kids math. I’m constantly learning, and am so glad to share what I’ve learnt. (I hope you’ve joined me in our Math Games series). Come and Play with LessonsLearntJournal.com @ The Weekly Kids’ Co-Op! Have you been featured today? Please take our Featured at Lessons Learnt Journal badge. We love sharing awesome ideas with our readers and look forward to seeing the many great ideas linked up each week. 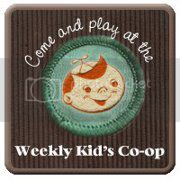 The Weekly Kids’ Co-op is co-hosted by a group of 50 fun kids’ blogs. By adding your your child-focused link at the Weekly Kids’ Co-op, we’ll share your idea across all of our child-focused blogs. We’ll pin the best on our very popular Weekly Kids Co-op Pinterest board. Don’t forget to follow The Kids Co-op on Facebook.